You know those chavs (or whatever the American equivalent is [whats? --ed.]) you see hanging around the shops in their hoodies and sneakers, who you think will never amount to anything? Think again. "Do you wanna come with me? 'Cause if you do then I should warn you, you're gonna see all sorts of things. Ghosts from the past. Aliens from the future. The day the Earth died in a ball of flame. It won't be quiet, it won't be safe, and it won't be calm. But I'll tell you what it will be: the trip of a lifetime!" There's a bit of a divide among Doctor Who fans regarding Rose. Her detractors allege that she's nothing but a Mary Sue figure, someone put into the story just to do everything the audience always wished they could do. And... well, they're right. But so what? Doctor Who began as a children's show, and it still is, in a way - the fans it's really aimed at are the ones who, however old and grown-up they get, still watch through the eyes of the inner child marvelling at the cardboard spaceships and hiding behind the sofa from the cellophane monsters. We do wish we could do what Rose does - step into the TARDIS, leave our mundane lives behind, dive headfirst into all of time and space, and best of all, turn out to be good enough to deserve it. And in my case, it helps that Rose is also Ace MkII; I had a big crush on Ace. 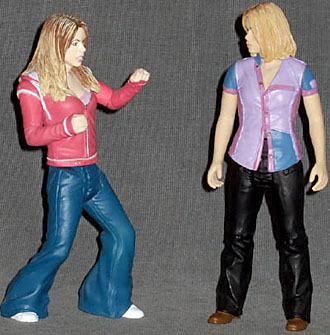 This figure is from the infancy of the Character Options Doctor Who line - they nailed the job pretty quickly, but you can still spot a "first wave" figure right away from the preset pose. Rose is rearing back in surprise, fists half-raised as if she's not sure what the heck it is just jumped out in front of her, but it looks like it might be going to cause trouble. She's decked out in a fairly telltale-chav ensemble [seriously, whatever that is, we don't have them --ed.] of loose jeans and a neon pink hoodie - ye gods - with her name stencilled onto the back of it. This line has exceptional faces, and even though this particular figure is early work, and a bit off the mark, you can see the likeness getting there regardless. It looks better close up than it does at a distance, when you can see the fine detail work around the lips and bared teeth, and the fine paintwork on the eyes. Her hair is rendered with a yellow drybrush across a dark base, which works pretty well, though it could've stood to be a bit more silver-blonde and less cornfield yellow. This is a UK version of the figure - I've seen the same figure here in Sydney with hideous bright yellow hair, so don't buy blind if you can avoid it. Articulation is a far cry from the satisfying allotment given to later Doctor Who figures - Rose gets just swivels at the neck, shoulders and waist, and peg hips, basically limiting her to a single pose, with arms raised or lowered slightly. Her hair is a rigid plastic piece, not the flexible plastic Character Options would later take to, so her head is completely immobilised by it. Not their finest hour by any stretch - just as well they learned quickly. 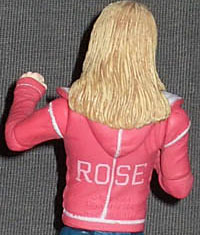 By the time this figure was in the works the show was already in its second season, and that's where Rose's accessory comes from - the battered old K-9 from "School Reunion." The sculpt is intact - since it's reused as pristine new K-9 - but the painted dents and scratches are convincing, with silver applied over brown to give a realistic rusted look; I used to do the same thing on Warhammer 40,000 tanks. On my K-9 his eyes are missing - they're a separate clear red piece that slot into the face, and they just weren't in the pack. K-9 has wheels in his base so he can trundle around, but aside from that he's just a solid piece, which is a bit disappointing - no articulation on the neck or tail, no retractable blaster in his nose, no swivelling ears... 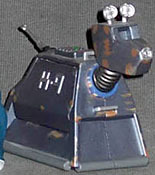 I'd like to see a better K-9 figure at some point, he deserves it. The saving grace of this one is that his side panel is removable - push on the control pad on top of his back, and the panel pops off to reveal all his inner workings, rendered in dark copper plastic with heavy shadows, and a few paint apps to pick out a detail here and there. So far as I recall it's a decent approximation (given the limitations of the figure) of the real thing. This Rose isn't a bad figure - it's just that she comes off second-best to the subsequent Rose, and Character Options hit their stride with Doctor Who figures in general so quickly that this early effort looks amateurish. Still, put her alongside the likewise-preposed Ninth Doctor, and they make for a nice little desk decoration.